Vail’s Lindsey Vonn is not only back on skis and training on snow ahead of this weekend’s World Cup opener in Soelden, Austria, but the defending Olympic downhill champion is also back to crashing. Vonn on Monday posted a homemade GoPro video of her first crash since blowing out her right knee in a super-G at the World Championships in Austria last February. Earlier this month, Vonn made headlines by speculating she could return from her injury in time for Soelden. She trained on snow in Portillo, Chile, in September, and told reporters she might be back into race shape for the opener. If not Soelden, she said she would definitely be back for the women’s downhill Nov. 29 on Beaver Creek’s new “Talon’s” course. 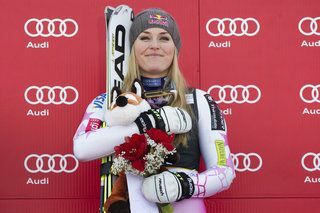 However, she added she’ll likely skip slalom events, as they would put too much strain on her surgically repaired knee. Between Soelden’s opening giant slalom on Saturday and the downhill Nov. 29 in Beaver Creek, there’s a women’s slalom scheduled for Levi, Finland on Nov. 16. A spokesman for the U.S. Ski Team said Tuesday that a final start list for the Soelden opener, which includes a men’s GS on Sunday, likely won’t be released until Thursday. Vonn, 29, needs just three World Cup wins to tie retired Austrian legend Annemarie Moser-Proell for the most women’s victories (62) in World Cup history. Beaver Creek, which is testing its new course ahead of next season’s 2015 World Championships, will host three women’s events, including a super-G on Nov. 30 and a GS on Dec. 1. In 2011, Vonn won a makeup super-G at Beaver Creek on the men’s Birds of Prey course. Depending on whether she races (and wins) at Soelden – where she won a GS in 2011 – Vonn could tie or even break Moser-Proell’s record on home snow Nov. 29-Dec. 1 at Beaver Creek. Lindsey Vonn has been training on snow in Soelden, where she crashed recently (Red Bull file photo). If not, she’s a virtual lock to surpass the all-time mark at Lake Louise, Alberta, Canada, the following weekend, where two downhills and a super-G are scheduled for Dec. 6-8. An astounding 14 of Vonn’s American record 59 World Cup wins have come at Lake Louise, and she won all three races there last year en route to six total wins before her injury. The Vail surgeon who repaired her ruptured ACL and MCL, Dr. William Sterett of Vail-Summit Orthopedics, said he isn’t surprised by the speed of Vonn’s comeback.